While LG has started to make its way back into the hearts and minds of the average consumer with the impressive Optimus G Pro, and its sexier cousin the Nexus 4, the company still has other market segments to worry about. This is where things like the F-series comes in handy. Today the Optimus F5 and Optimus F7 were announced and, like their keyboard-dwelling namesakes, will probably be something we're aware of, but rarely pay too much attention to, despite their usefulness. Aside from the dual-core processor and smaller amount of storage built in, this handset doesn't actually differ that much from the Optimus G. Which is strange, but sure, why not? We've seen weirder things. While we'd be hesitant to call this "mid-range", it's clearly intended to occupy a slot just slightly below the company's main flagship. For those who don't want to do the math themselves, the resolution of that "256 ppi" display is 960x540, or qHD. Why LG has decided to opt for ppi instead of actual resolution, we're not sure but, to be fair, ppi is where the real competition seems to be these days anyway. That one oddity aside, the 5MP camera, sub-300 ppi and dual-core processor means this device isn't targeted towards the spec nerds in the audience, but may could still find a comfortable home with a discerning yet contented customer. Of course, the F5 will launch in Q2 in Europe, with the F7 following shortly thereafter in "select markets." While these handsets may be scraping their way into the lower echelon of "high-end" with the current set of specs, it could easily be a much different race in a few months when the HTC One is out, and the GS4 and possibly even a new Nexus have been announced. 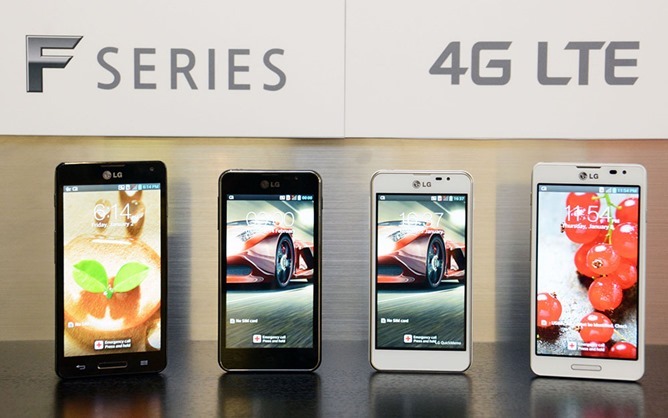 SEOUL, Feb. 21, 2013 – LG is expanding its solid 4G LTE presence with the introduc-tion of its new Optimus F Series at Mobile World Congress (MWC) in Barcelona. With LG’s industry-leading LTE technologies, the Optimus F Series is designed to bring a premium user experience and the speed of 4G LTE to a mass audience. 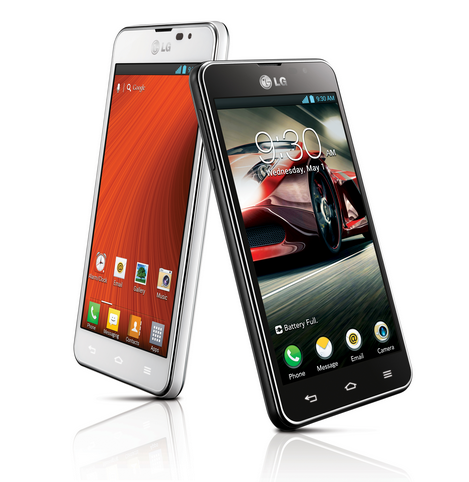 Two devices -- Optimus F5 and Optimus F7 -- will make their global debut at the show. The Optimus F5 is a 4G LTE smartphone with a 4.3-inch IPS display running on a 1.2GHz Dual-Core processor and largest-in-class 2,150mAh battery while the Optimus F7 offers a 4.7-inch True HD IPS display and a 1.5GHz Dual-Core processor powered by a large capacity 2,540mAh battery for long lasting performance. Both devices will be available with the latest Android Jelly Bean 4.1.2 OS and will include advanced UX features such as the upgraded QSlide and Live Zooming, previously only available in LG’s premium devices. The upgraded QSlide allows users to open two apps at the same time, both in full screen mode. Users can change the size, position and transparency of QSlide apps according to their preferences. Functions now compatible with QSlide include video, browser, memo, calendar and calculator. 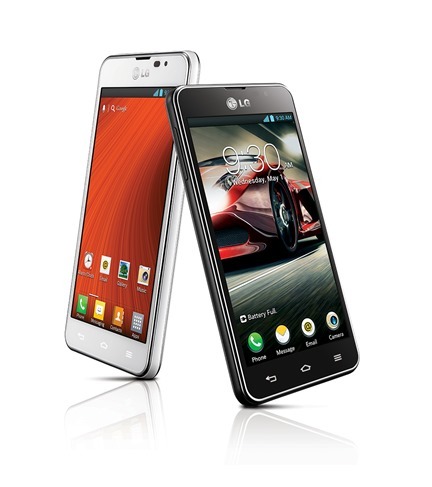 Live Zooming, previously only seen in the Optimus G, is now standard in the Optimus F5 and Optimus F7. Live Zooming allows the user to zoom into a specific area while watching a video. Additional features included in both Optimus F Series devices are QuickMemo, QTranslator, Video Wiz, Safety Care and much more. The worldwide rollout of the Optimus F5 will begin in the second quarter in Europe, followed soon by the Optimus F7 in selected markets. Exact timing and pricing will be announced at a later date.